Plan out your day: As part of my nightly routine, I take about 20 minutes the night before to make sure that everything is in order and tomorrow is planned out. For me, that looks like writing in my bullet journal, both recapping the current day and writing down anything that I need to get done the next day. This allows me to decompress from the stresses of the day and start a relaxing evening. I also make sure that I have work clothes for the next day. I wear a uniform, so I don’t have to technically pick out my outfit, but I do make sure I have clean clothes ready to go and that I know where my shoes, ID badge and anything else I will need is. If you don’t have something specific you have to wear, then you might try planning out your outfit for the next day, including shoes and jewelry. This will let you know if anything needs ironing, if you need to find that missing earring or anything else that might come up. These last minute “emergencies” are what set your day off on a stressful note and will derail productivity throughout the day. I also check what’s on the menu for dinner the next night to see if I need to thaw out any meat or put a crockpot meal together. Go to bed with a clean house: This doesn’t mean that everything has to be deep cleaned, but knowing that there’s no dishes in the sink and that the bedroom is picked up will help you sleep better, and you won’t wake up to a mess, which can also cause undue stress in the morning. Go to bed at a decent hour: This should be common sense, but life does tend to get in the way, especially as the days are progressively getting longer and it definitely doesn’t feel as late as it really is! Adults need 7-8 hours of sleep, so do the math. If you want to get up at 6, you need to be in bed around 10pm. Set an alarm and stick to it: If you are trying to wake up at 6am, then set an alarm and wake up at 6am. Don’t continue to hit the snooze button. Not only will those 9 minutes of snooze not really help, it can actually hurt you and make you feel even more tired. If you have to, put your phone or alarm clock on the other side of the room, so that you have to physically get up in order to turn it off. I’m still working on this, as it was just a constant practice to hit my snooze button until the last possible minute. But I’m realizing that I wake up more refreshed in the morning if I wake up on the first try. Don’t fall into the black hole that is Social Media first thing: Whether it’s checking Facebook or Instagram, or responding to emails, don’t do that before you even get out of bed. You will fall into a black hole and before you realize it, an hour has gone by. For me, it was weird not looking at Facebook, so I compromised. I get up, make a cup of coffee and sit out on my porch. I allow myself to go on social media while I drink my coffee, but once I’m done, then I put my phone away and go on with my day. Usually it’s about 20 minutes, and it’s a perfect balance. Exercise: I don’t exercise every morning. Sometimes it happens in the evening if I want to do a longer run or if my day has to start earlier than normal. But I do very much enjoy an early morning run, before the heat intensifies. It just makes me feel like I’ve already done something productive for the day. These things have helped me get up and be productive at least two hours earlier than before I started this. My job allows me to start working whenever I want to, so it’s kind of an added boost when I get to start early, that just means I get off work earlier and have more of the evening to decompress, work on home stuff or do things with friends and family. Comment below, what are some things that you do, either the night before or in the morning that helps your day be more productive! Such great tips! I love being a morning person and don’t think I will ever go back. It’s been so great being up early! I feel like I’m so productive throughout the day! 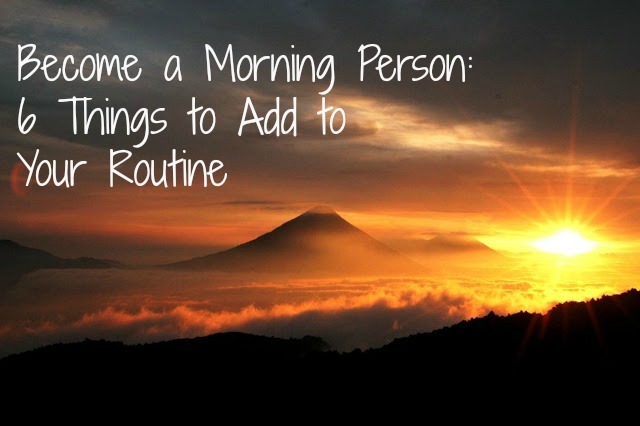 And my whole day feels off when I don’t get to have my morning routine!